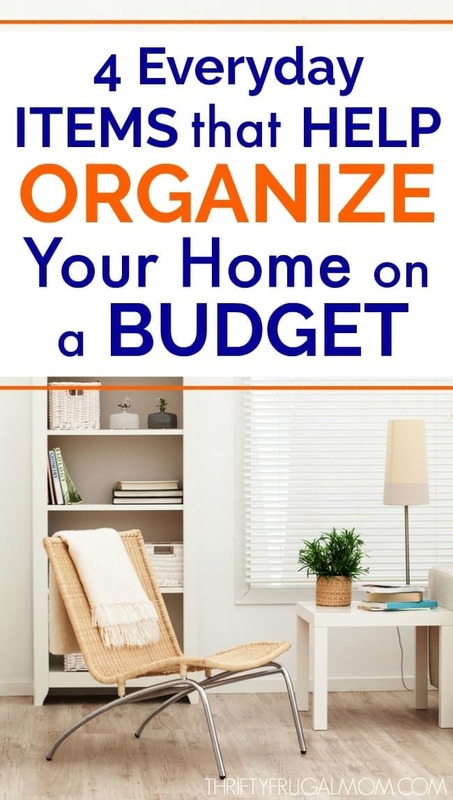 There’s no need to spend lots of money organizing your home. Use these every day items that you already have to bring order and organize your home on a budget! My husband is an amazing man of many talents, one of which is organizing. I kid you not. He can organize anything and make it functional and neat…and it always leaves me in awe. 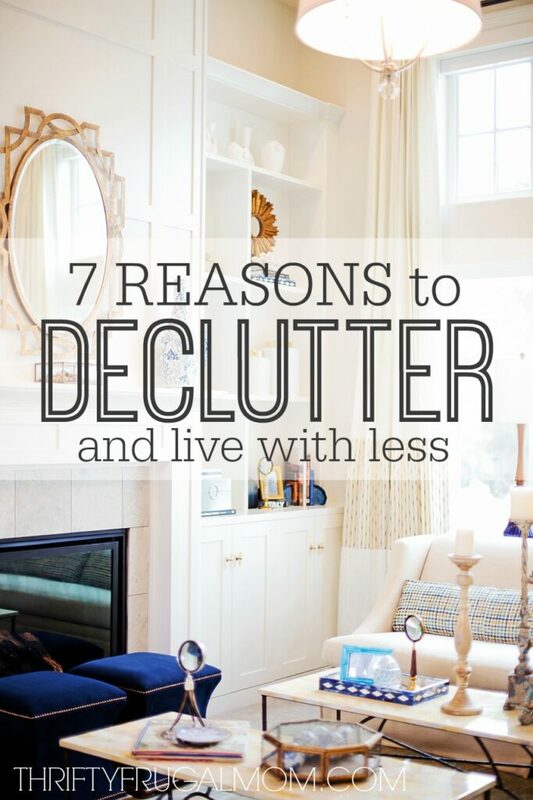 Because while I am organized in some things and love the benefits of decluttering and living with less, actually doing the organizing itself isn’t something that comes naturally for me. I can do it, but it always takes me forever and I arrange and rearrange and then arrange some more before I am actually happy with the result. The other thing he is really good at is working with what we have. I’ve learned so much from him about inexpensive home organization ideas! To be clear, I’m definitely not against buying beautiful things to use to organize your home. I appreciate beauty and use pretty things for organization too, especially for items that are going to be highly visible. But sometimes simple, everyday household items win the day…and help keep that bank account just a little more cushioned, too! 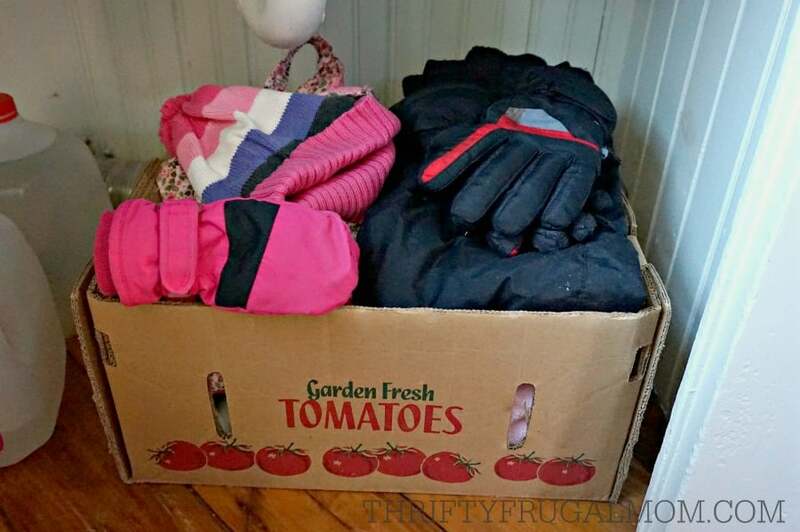 Want to organize your house inexpensively too? Here are 4 every day items that we use as well as some of the ways that we have used them. This random little wicker basket was in our “to be donated” pile when I grabbed it and put it to work organizing our extra Mason jar lids. 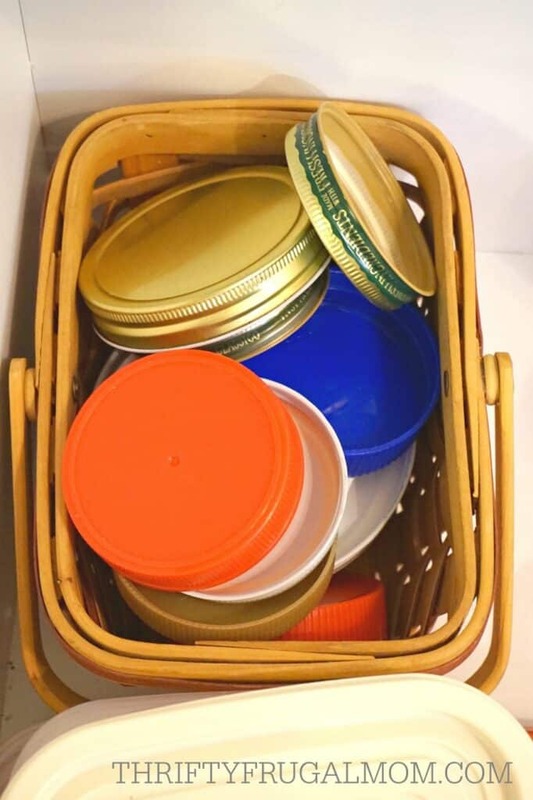 When we no longer needed this plastic basket for laundry room organization, I realized it would work perfectly in the kitchen to neatly organize the lids in my container drawer. I had tried quite a few things before this, but none of them worked as well for me as this plastic basket! The great thing about boxes is that they come in every shape and size, which makes it easy to use them to organize almost anything! We love using checkbook boxes to organize small things in drawers. Here you see how I use them to keep my measuring spoons contained. Both my husband and I also have them in our desk drawers to organize things like keys, small office supplies etc. We had a terrible time keeping our kid’s coloring books neat. Finally one day my husband had enough and found a box that held them all perfectly. It’s totally taken care of the books-falling-everywhere problem! Our mudroom/laundry room in the back of the house doesn’t have a good place for putting the kid’s coats and hats and it was a continual headache. Once again a simple box saved the day! We put it on the bottom floor “shelf” of the built-in laundry cupboard and it solves the problem wonderfully because all of the kids can access it easily. 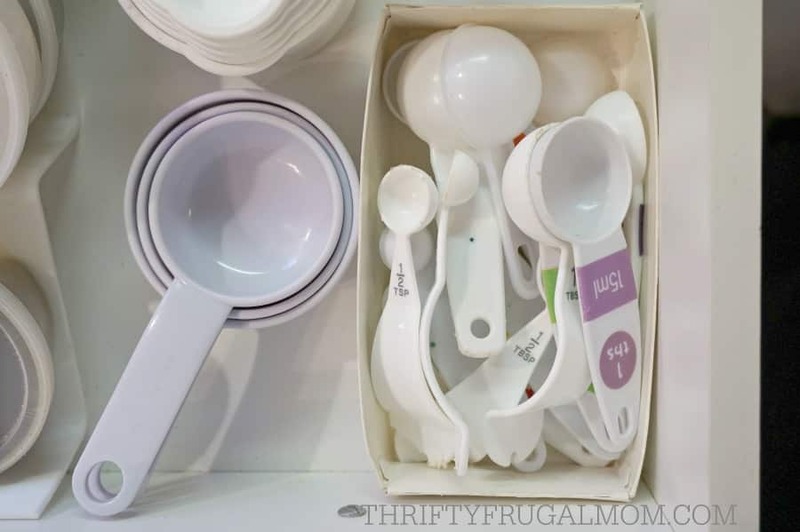 I’m pretty sure all of us have plenty of empty food containers, which makes them the perfect item to use to organize your home on the cheap! 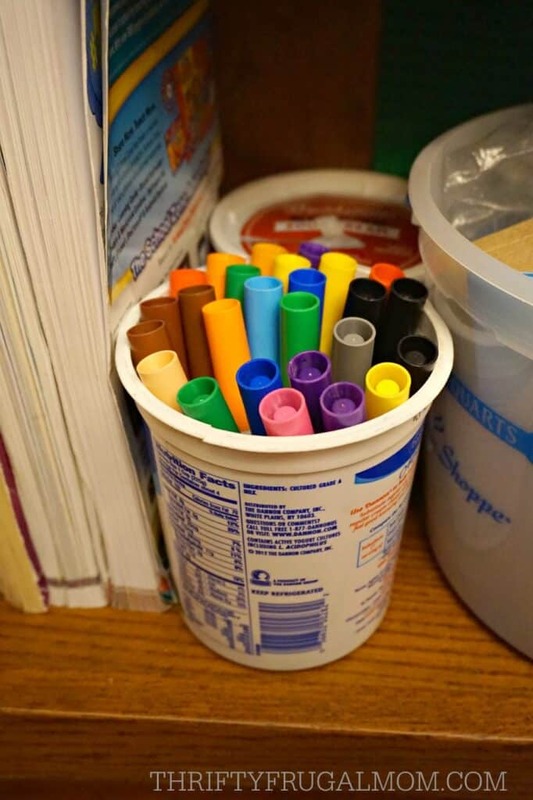 An empty yogurt container works perfectly for holding markers. And if you’re observant you probably also noticed that there is an old cottage cheese container in the background of the photo, as well as an ice cream bucket. Clearly we take this thing of using old food containers for storage pretty seriously! The cottage cheese container stores our small magnetic letters. 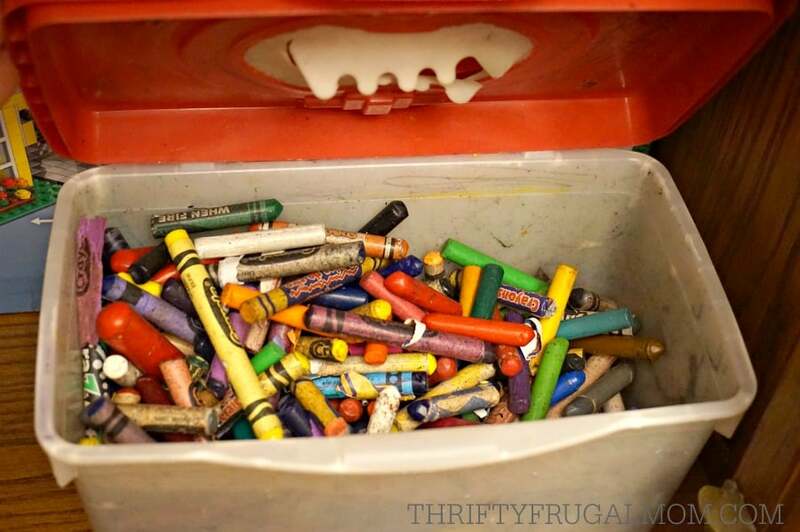 And the ice cream bucket works perfectly for holding various craft supplies that the kids like to use. Tired of all those seasoning packets falling everywhere? Again, an old food container for the win! I usually try to buy baby wipes in the soft plastic packages just because I feel like there is less waste and because I also like that they take up less space. But sometimes I still end buying the ones in the hard plastic containers for one reason or another. And when I do, we often end up putting them to use organizing something when they are empty. They work great for holding crayons. ….or toiletry items. The uses are pretty much endless! 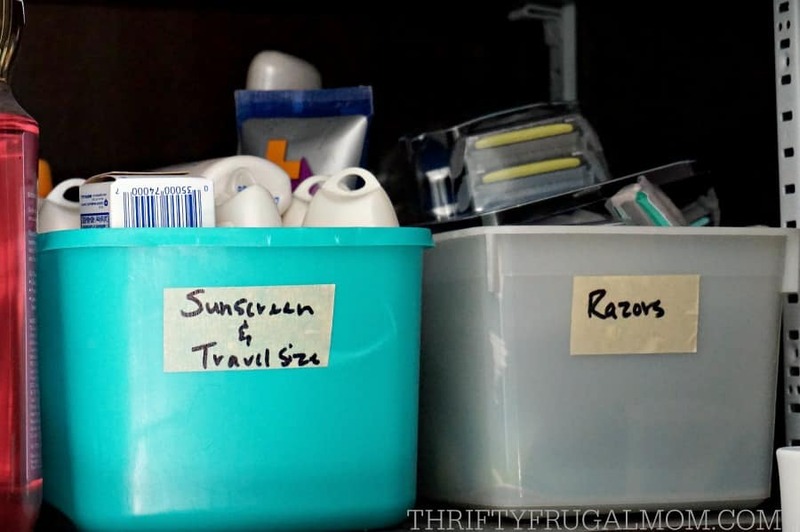 What do you use to organize your home inexpensively? Great ideas. To make some of these containers more attractive,don't forget scrapbook paper is cheap and you just glue it to the containers. This is especially nice and works well when containers are out in the open in a room where guests usually will see them. Just makes for a more pulled together look that is attractive and inexpensive. You can even do this with wrapping paper or maps, etc. Great ideas. I use what I have as well. Spending gobs of money to organize is silly, when you use your creativity. Using what you have is so key to saving money in so many areas! 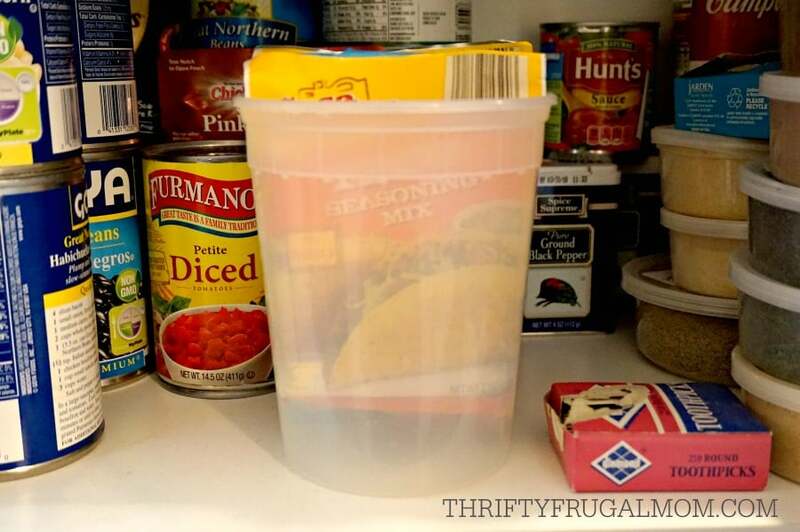 We use wipe containers to store stuff in our house too! Sometimes I am not sure which are wipes and which are toys haha. 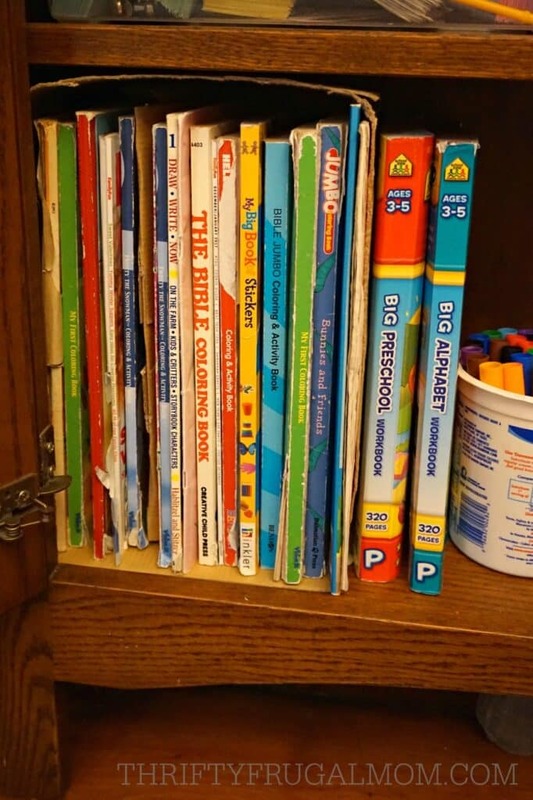 Great idea using check book boxes, they are a great size for some smaller items in my office. Thank you for the post! Ha! Glad to know I'm not the only one who has wipe container confusion! My two little girls love to grab the real wipes container and take to "play" with their dolls and it is such a pain! And yes, check book boxes or other similar small ones are my favorite. I actually have a total of 3 in my desk drawer just because they are such a perfect size! I've started keeping a peach box (similar to your tomato box) in the back of my SUV so the groceries that are likely to roll out the back when the door opens doesn't. My can opener cuts cans without leaving a sharp edge so I use the larger cans from tomato sauce for markers in my son's room. Also, I spray painted 5 regular sized cans from beans for my college daughter and she keeps them on her desk for pens, pencils, scissors, tape, and such. They're actually quite cute. These are all good suggestions and examples of how we can use stuff we have. I think sometimes we don't think about reusing stuff. I with I could think of a way to reuse the containers my dishwasher tabs come in. Any ideas?! Oh, the box in the back of your SUV is a smart one! I'm always trying to stack the bags strategically and it's kind of crazy. 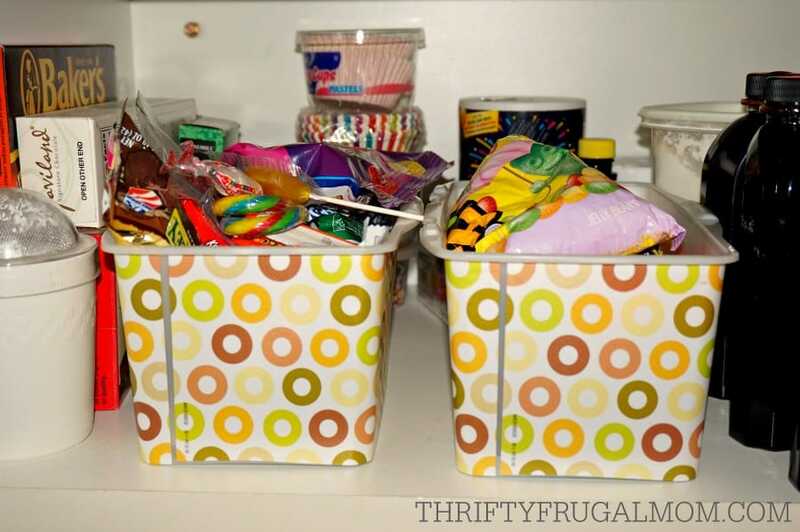 And great tip on the idea of using old cans for organizing too. Should work well! I pretty much always buy the bags of dishwasher tablets, but those plastic containers should work great for organizing! You could use them for pretty much anything (and they even have a nice lid, right?! 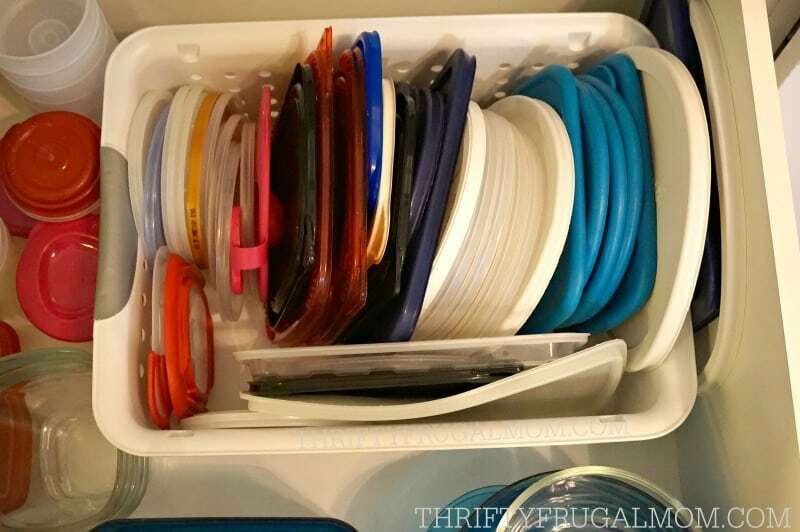 ), but a couple of things that popped into my mind were: a container for holding gloves, a toy/craft organizer, organize little brushes that you use to clean etc. Glad you found it helpful, Phil! The check book idea is great. I had never thought of that. One of my husband's brilliant ideas! They're just the perfect size. Funny how something as simple as boxes can make such a difference in how well my cabinets are organized. I'm loving it. Thank you! I'm slowly learning that often simple equals amazing! So glad that you're enjoying a more organized life. :) That's always a good thing! Ahh, I finally found someone who does organization JUST LIKE US! I had to smile when I saw this post and thought what fun it would be to show you our baskets and boxes. :-) When we first were married and I had extra time. . . I grabbed a can of cheap spray paint at the Dollar Store and spray painted the cardboard boxes a cheerful coordinating color. Yes, cardboard can be spray painted. you have to do it carefully so it doesn't get too wet, but it gives a great finished look. Another place I use cardboard boxes is under the bed. We don't have a pantry, basement, or cellar so I keep all those hundreds of jars of home canned food in very sturdy long low cardboard boxes under the beds. I found identical ones at the grocery store that were actually BLACK and classy looking. Now when I go to the pantry for green beans or peaches I just pull the appropriate box out from under the bed (like a drawer) and there are my cans. Ha. Problem solved! I wouldn't actually use that space for anything else anyway because I hate clutter under the bed. And this keeps socks and other mysterious items from losing themselves under the bed too! Never thought of spray painting boxes! Good tip! And I'm all about saving money on things like this to spend it on things that I care about so much moe.